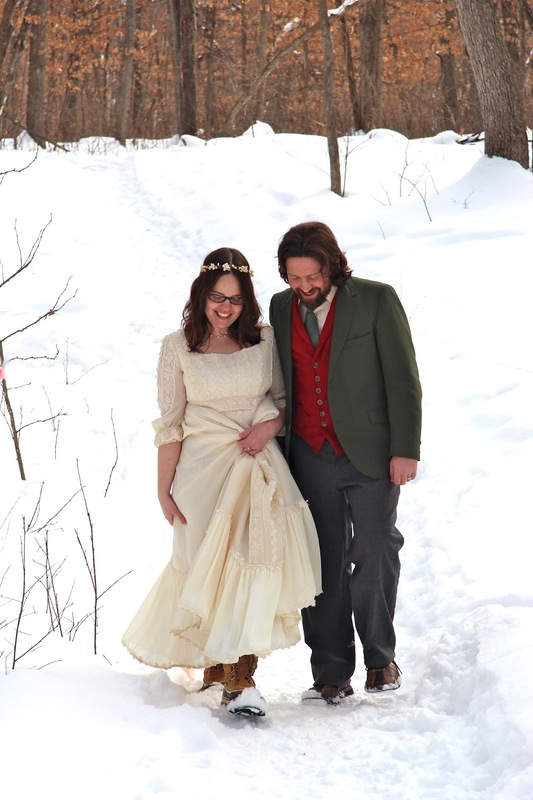 John and I got married! We had beautiful weather, a small gathering of important family and friends, and a lovely, casual reception "catered" by yours truly. :) Since our wedding site (for both the ceremony and reception) was small and rustic, (heat and electricity, but no formal kitchen,) we kept things simple and enjoyed a buffet of homemade soups, salads, breads, cheeses, crackers, olives, and bars! I have no pictures of the food, as I barely sat down to eat during the reception -- too many people to talk to! Cinnamon Streusel Buttermilk Coffee Cake is new to my recipe repertoire, but has become a fast favorite. The cake is quick to prepare, uses basic pantry staples and my favorite baking ingredient of all time, buttermilk! Deliciously sweet, spicy, nutty, and rich, this cake encourages a lazy breakfast with a cup of coffee. And the first dinner I cooked for my husband . . .
Homemade pizza! Just goes to show things don't have to be too fancy or complicated to be special. :) Half-whole-wheat Artisan Bread in Five crust, topped with pizza sauce, mozzarella, parmesan, green olives, red onions, mushrooms, and a sprinkling of dried oregano. John and I still have plenty of busy days ahead, as we still have to move in together! We are currently splitting our time between our respective places, and look forward to finally having one home by the end of this month. My postings may continue to be spotty, as I'll have to pack up and move my kitchen soon enough! With the upcoming move, I am, of course, looking at trying to use up many of the pantry staples I have on hand. What are some of your favorite meals using pantry staples? A million congratulations! I am so happy for you both. Wow, congratulations! So exciting and I love the wedding pic! Yay--that is a great picture of you two! Have you gotten all the photos back yet? I wish I had snapped some pictures of the food for you! I thought about it, but figured with a "real" photographer you wouldn't want/need my bad cell phone pics. I am sorry! Congratulations! Looks like a beautiful wedding, I love the outdoors shot and the home cooked food!